Home » Tickets » Broadway Tickets » Oklahoma! Tickets are on sale now for Oklahoma! at the Circle in the Square Theatre on Broadway. Simply put, Oklahoma! is perhaps one of the most iconic musicals, not just in the Rodgers & Hammerstein canon, but in Broadway history. The musical marks the first collaboration between composer Richard Rodgers and librettist Oscar Hammerstein II, bursting onto the scene with a 1943 Broadway premiere that swiftly became a box office sensation and ran for a grand total of 2,212 performances. It was also awarded a special Pulitzer Prize in 1944. Since then, the musical has enjoyed no less than five Broadway revivals, including the current critically acclaimed version by director Daniel Fish, three West End productions (including an Olivier Award-winning 1998 National Theatre revival that starred Hugh Jackman), countless national and international tours, and even an Oscar-winning 1955 film adaptation. 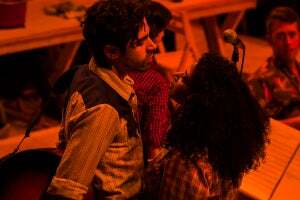 This Bard SummerScape production enjoyed a sold-out run at Brooklyn’s St. Ann’s Warehouse in the fall of 2018, earning rave reviews, and in December 2018, a Broadway transfer was announced after the production secured the Circle in the Square Theatre – the perfect venue to accentuate the exhilarating, immersive nature of the show. The limited Broadway engagement is scheduled to run from March 19 through to September 1, 2019, with an official opening set for April 7. People Will Say We’re in Love with this new production… and they’ll be darn right! Due to the mature content in this production, it is recommended for ages 12 and up. The Bard SummerScape production of Rodgers and Hammerstein’s Oklahoma! begins previews at the Circle in the Square Theatre tonight, ahead of an official opening on April 7 and a limited engagement through to September 1, 2019. The production previously played a critically acclaimed, sold-out run in Brooklyn's St. Ann's Warehouse from September 27 to November 11, 2018. It was heralded as "Best of the Year" and a "Critic’s Pick" by The New York Times and the "#1 Theatrical Event of the Year" by TIME Magazine. Complete Broadway casting has now been confirmed for the previously announced transfer of the Bard SummerScape production of Rodgers and Hammerstein’s Oklahoma!, which played a sold-out run in Brooklyn's St. Ann's Warehouse from September 27 to November 11, 2018. Previews begin at the Circle in the Square Theatre on March 19, 2019, ahead of an official opening on April 7 and a limited engagement through to September 1, 2019. We Cain't Say No to this! The Bard SummerScape production of Rodgers and Hammerstein’s Oklahoma!, which recently played a sold-out run in Brooklyn's St. Ann's Warehouse (from September 27 to November 11, 2018), will transfer to Broadway this coming spring! Previews begin at the Circle in the Square Theatre on March 19, 2019, ahead of an official opening on April 7 and a limited engagement through to September 1, 2019.